As an apartment dweller once, I did nothing BUT container vegetable gardening. To survey one’s pots brimming with edibles and flowers is like falling in love... be still my beating heart. If there’s no hope for a plant to poke its head out from between the tiles on your patio, and there’s not enough dirt in the corners of your house, then get potty! Container vegetable gardens are a great alternative for those that don't have access to a garden, backyard or even a balcony. Easy for the less mobile and the handicapped. An outdoor potted vegetable garden is usually extremely attractive and serves the dual purpose of style and function around your patio. Indoor plants make a house look like a home as well as bringing nature and food, well, indoors. They need a sunny space. An advantage with vegetables grown in containers is that you can move the containers around to follow the sun and seasons if necessary. Using wheelie trays or dollys, wheelbarrows or pots in wheelbarrows, makes moving larger pots a bit easier, but not as peachy pie as you think. Bend your knees, don't slip and watch your back! The no dig vegetable garden can be just as successful in containers, provided similar guidelines are followed. Indeed it’s a breeze really and usually there’s not a snail within cooee to spoil your fun. Even a non no-dig gardener is NOT likely to go galumphing around in galoshesdigging into pots with a spade... so, we can’t truthfully describe no-dig container gardening here. We’ll call it more layer gardening. Layer the materials in good sized containers in a simplified version as outlined in build a garden. Build up the soil in the pot using no dig materials, making layers such as hay, fertilizer, straw, compost etc, then topped with mulch. Build all this in your non-growing season, mound it up high and let it decay down so that hopefully it is about level enough to plant in spring. Like a Lasagna Garden, make the compost actually where is and as is in each pot, adding enough soil layers to supply some worms and bugs to help turn it all into compost — like No. 1 above, mound it high and allow time for it all to process before planting. Use very large spare containers with lids as mini compost bins to do as above and then use the composted or nearly composted soil to fill up your pots as you need to. (I did this at one end of my balcony, hidden under the shelves which held the pot plants. I kept these compost/worm-farm little factories producing rich soil, mostly from kitchen scraps; adding a bucketful of sand now and then, plus old potting mix from used up pots). Buy or make a worm farm and toss in your kitchen scraps. 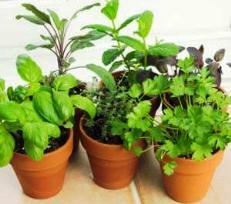 To fill up your pots first time, you will have to buy potting mix or compost. From then on add the worm castings to your pots and use the liquid for feeding. Unlike ground gardening, there’s no need to put a weed or seed blocking layer first in your pots; just a piece of something like a stone, clay, bark, sponge or whatever’s handy, to go over the drainage hole or a thin layer of stones or clay bits and pieces to cover many holes if necessary. Have a plant pot saucer or use old dinner plates, lids etc to put under your containers. This ensures that some water can drain through the pot and be taken up slowly over hot weather. Don’t have saucers that are too big, otherwise mosquitoes might breed in drainage water after a week. Also your vegetables are not like waterlilies, so they don’t like perpetually sodden soil. 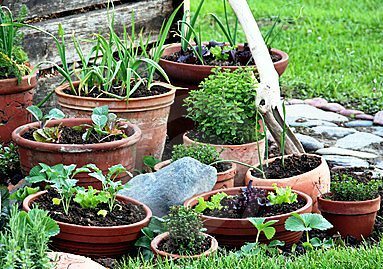 Naturally if you’re doing your container vegetable gardening on an outdoor patio or balcony and you don’t mind water seeping out from the pots and staining the surrounds, then there’s no need to put saucers underneath. Porous soil is a must in pots to allow for good drainage and air exchange. Just like garden soil, if it’s too sandy it will not retain moisture and if too fine like clay it will compact. Drainage is vital, so get your set-up correct first. Ensure your containers have large enough drainage holes so they allow water to escape. If they clog up, the plants will 'drown' and suffer from lack of air to their roots and be susceptible to disease and rot. Rats! My word, those little creatures love to climb up to balconies, shimming up walls or drainpipes even, and under cover of darkness they will dig up your container plants, knock them over if small, eat any vestiges of un-rotted compost and nibble roots. Possums, raccoons and similar climbing scallywags can be just as destructive, so get a cat, dog or trap — up to you. To help stop smells from compost, especially if your pots are inside or nearly, and to help control moisture and temperature, put 3-10 newspaper layers on top of soil before you add mulch. This also deters birds from scratching up the soil. Do make sure you check the soil for when to water, just in case it has dried out underneath the paper. It’s all in a day’s work for a lettuce to grow if it has the right conditions. IF you can’t make compost or do any no-dig layer things, don’t worry. You may have only a window-sill, a sunny table-top, a neat’n tidy porch and you don’t want mess and muck, in which case buy your organic potting mix by the bag. You’ll still get healthy veggies and still the thrill of growing your own. Because their roots are restricted, potted veggies need constant vigilance. Watch and correct signs of wilting in particular. 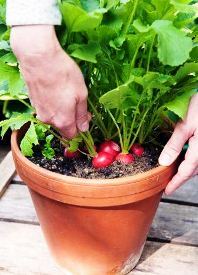 It’s so easy for pots, especially plastic pots to heat up and fry plant roots. Clay pots are prone to drying out their soil contents quickly so keep a watering system handy. Preferably set up an irrigation system of small, flexible pipes that drip into each pot when you turn on a tap. Otherwise use a hose or watering can and give your pots their main watering in the morning before the sun gets high and hot. Just like vegetables grown in the ground, stress by any means, such as lack of water even for a short time, lack of nutrients, cold snaps, blasts of wind and so on, will more often than not result in the vegetable plants producing small harvests, succumbing to disease, or in some varieties, bolting to seed. Roots go down and out a remarkably long way in most plants when grown unrestricted, so when contained by walls, roots have no means to go further and deeper in search of food and water. Due to extra watering, nutrients get washed away quicker in a container than in the ground also. Thus as well as watering, regular feeding is a must. 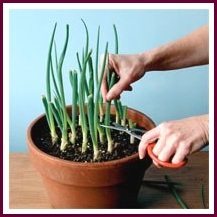 Use diluted liquid fertilizer every 1-3 weeks depending on what plants you have growing. Here are some quick and easy recipes for making compost tea and other liquid fertilisers you can brew up at home in just days or a few weeks. It is also very important that a mulch is put on top of the container, especially when plants are small, pots are big, and there's lots of soil exposure. This will slow evaporation and keep the surface temperature of the soil cooler. Plants with smaller, fibrous roots like tomatoes can so easily dry and die in hot soil. Sharp gravel will act as a mulch and also deters diggers such as squirrels. Some of the rounded or coloured pea gravels are attractive and to a lesser degree will act as a pest barrier, but remember you will be replanting or repotting vegetables often, so will need to remove these sorts of permanent mulches when necessary. I never had any luck growing vines in containers. Mind you, I’ve never had any luck making my first $billion... but some people half my age have. So give vines a go if you have LARGE containers... don’t take MY failure to produce anything but miniscule cucumbers and useless marrows as gospel. How to Grow Superb Potatoes and Grow Juicy Tasty Tomatoes for growing in everything from tubs, baskets, plots and planters. And for all vegetables, here’s what you need to know about pot sizes and sorts, and a list of container gardening vegetables to grow. Picking and eating your home grown food is a pretty special feeling. 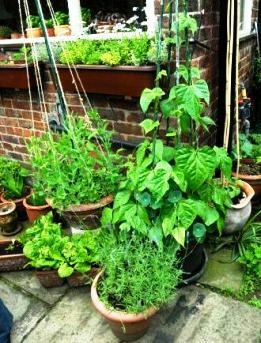 Do remember that a regular commitment is particularly important when growing vegetables in pots, all the more when everything is in full swing in summertime. Give your plants that 5-15 minutes quick check most days for watering, re-potting, and general once overing to avoid trouble and waste later. Give a LITTLE bit to get a LOT of bit — That's how it works with container gardening.